A note on the photos: these are screen captures of video, so not the best quality. However, they will give you a feel for conditions early in the blow, before it got interesting, so the seas are moderate by comparison to what came later . For what the rest looked like, we will have to use our collective imagination. 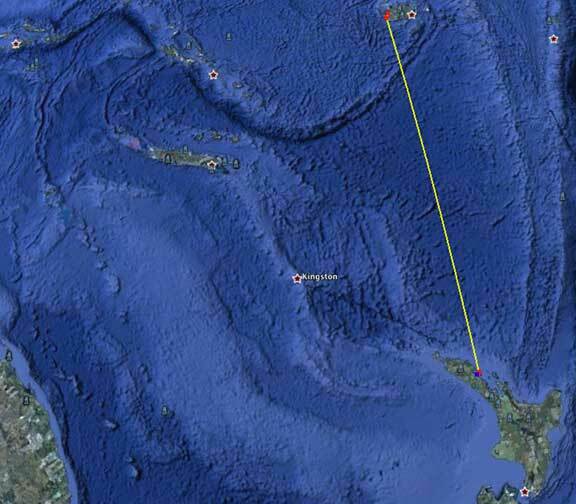 This passage is 1100 miles, with the weather systems often transitioning from the Southern Ocean, up the Australian east coast, to the Tasman Sea between Fiji and New Zealand. Tactics are simple. Wait until the leading edge of a high pressure system arrives, then head to New Zealand as fast as possible before the next front arrives.The trip up from New Zealand is much easier in that you are headed away from the weather. Typically by the third day (on our yachts) you are out of the high risk area and into the trade wind belt. Heading south, however, you, and the weather, are on a collision course, and the weather risks increase the further south you travel. Two factors contributed to making this data gathering exercise a reality. First, Avatar was on a schedule, so rather than wait for a perfect scenario, she left with known, but manageable (for her and the crew) risk factors. The second was total reliance on the GRIB files (GFS model) for weather forecasting (GRIBS are raw computer output). The data and photos which follow were kindly furnished by Avatar’s very experienced skipper, Nico Curbishley. 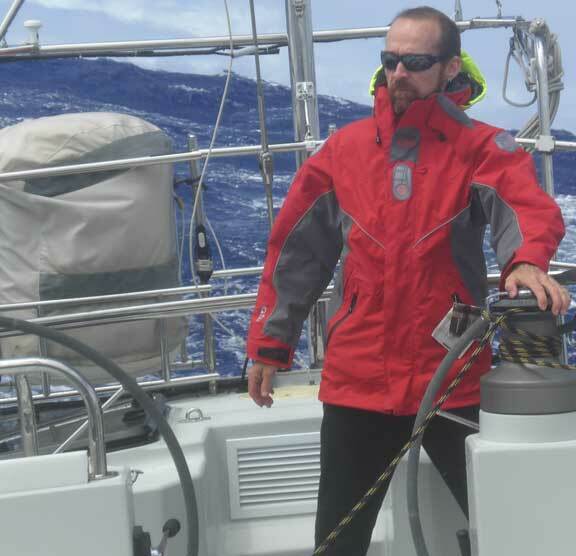 That’s Nico at the helm of another of our designs, the Sundeer 64 Raven, being being chased by a cyclone (note the overtaking sea rearing up astern) while sailing from New Zealand towards Panama. Avatar departed with light winds that gradually built from the south. The first couple of days she had runs of 222 and 218 nautical miles ( 9.1 knot average) in 5 to 15 knots of breeze, as the GRIB files had forecast. Then the weather deteriorated. Instead of the 20/25 knots of southerlies that had been expected, the wind built to a steady 30 to 40 knots, gusting to 49 in squalls, and stayed that way for the next two + days. Between wind, 16 foot or larger seas, and the usual adverse current, daily runs dropped to 189, 191 and 181 miles (7.75 knots). Our own experience in this part of the world is that heading south you lose 10 to 15 miles a day to current, so Avatar was probably cruising at closer to 8.5 knots through the water during the higher winds. 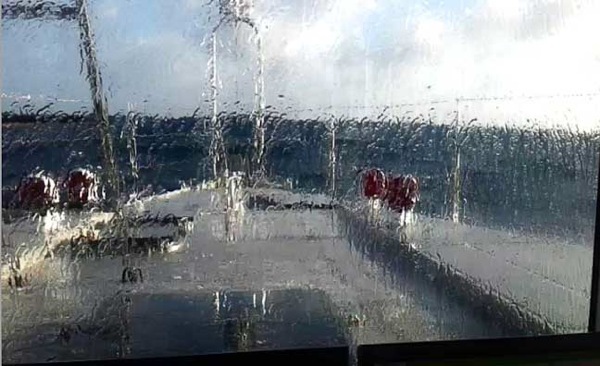 In the early phase of the gale the new waves were quite closely spaced, the worst sea state for the FPB 64 without the stern extension. The crew backed off the speed a touch and brought the bow off five degrees. 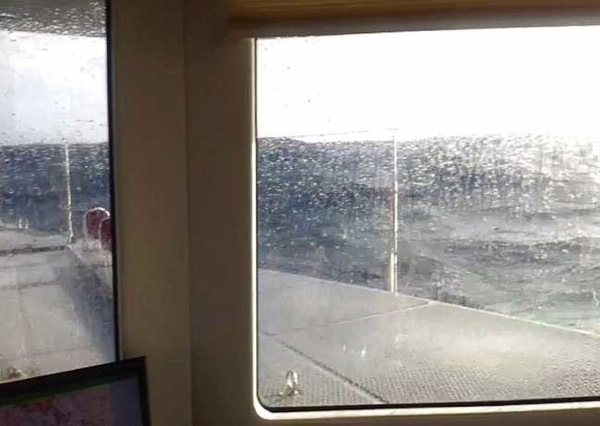 The wind waves were from the south, on the nose and there was a crossing swell on the bow quarter, which created a particularly uncomfortable confused wave pattern. 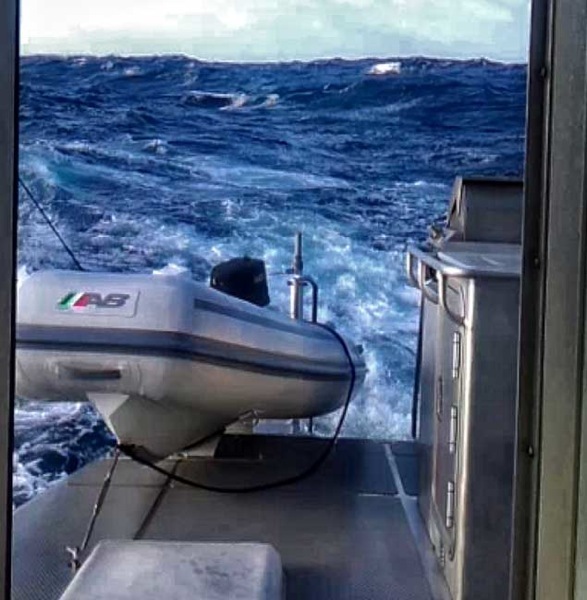 After the second day – with bigger seas – now averaging five meters/16 feet – Avatar resumed speed heading directly into the waves. During the gale there were three large wave impacts which caused estimated fifteen degree rolls. The boat came quickly back to upright without going into a roll to windward. In other words the stabilizers did not overcorrect. The NAIAD system was in “active” mode with settings of: Angle 40%, velocity 70%, and acceleration 20%. With big seas and a crossing swell we were interested to find out how the steering worked, and if the “bite” of the bow was sufficient to resist wandering during wave impact from the side. The report was: “No steering issues, the boat just kept marching on.” Autopilot settings were: Gain-2, Yaw-1, Counter Rudder-0. 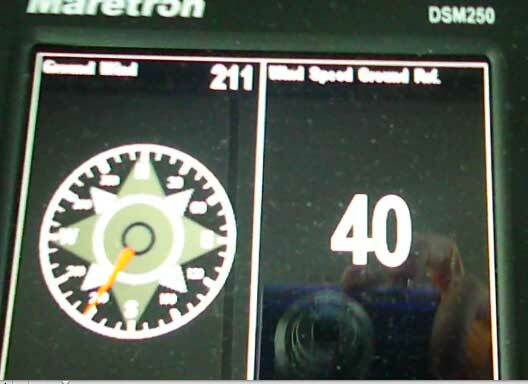 For the 1100 nautical mile trip, Avatar took 136 hours, for an average speed of 8.2 knots over 5.5 days. In doing so she burned 2600 liters of diesel, or .68 US gallons /2.36L per nautical mile, this at 1750RPM. She was carrying 5500L/1450 Gallons of fresh water and (at the start) 8000L/2100G fuel, effectively full load. Now some interesting interpolation. For the sake of this discussion let us assume the average through the water speed was 8.7 knots (allowing half a knot of adverse current). The hourly burn rate on fuel was 19L/hour or 5.50 GPH. Fuel burn includes hydraulic loads for the stabilizers, induced drag off the stabilizer fins, and electrical power generation.The engine CPU was reporting engine loading of 46 to 50% of available power in the heaviest winds, with 60% load as the FPB64 smacked into the occasional larger than normal crest. 5.5 gallons per hour equates to roughly 104 horsepower being produced by the John Deere 6068TFM 50. At 1750 RPM this engine is capable of delivering close to 200HP at the crankshaft, so even in these less than ideal conditions there is close to a 100% power reserve. As air conditioning was being run for the first three days of the trip it is safe to assume that at least half a US gallon of the fuel burn was devoted to these extra loads, so let’s say a net of five GPH for propulsion. With 3500 gallons/13,000L of fuel capacity, in adverse upwind conditions, Avatar demonstrated a range of over 5000 nautical miles including an allowance for current, auxiliary loads, sea state and excess windage – not that anyone would want to spend that much time heading uphill! There is a good possibility that the FPB 64 would benefit from overpropping, increasing propeller pitch, and reducing RPM for a given speed. However, the engine warranty would be voided so this should occur after the warranty period has expired. The balance between bow immersion for upwind work, and steering down wind where we know we are OK, looks right. Circa needs to look at adjusting the foundation settings on the NAIAD Adaptive mode closer to the Active values. If these weather patterns are of interest you will f ind extensive reference to this part of the world in Mariner’s Weather Handbook and Surviving the Storm. This includes detailed analysis of the Queen’s Birthday Storm and the 1998 Sydney Hobart race. This entry was posted on Thursday, October 27th, 2011 at 7:00 pm and is filed under FPB Series Notes, Most Popular. Both comments and pings are currently closed. On Iron Lady, we found that there were times when the Active setting on the stabilizers worked better then Adaptive and vice versa. The nod generally went to Adaptive however. There are apparently two different algorithms – one for each mode. My inclination would be to leave the settings as they are and then choose which ever mode produces the best motion. At any rate, between our boat show in an onshore gale, Iron Lady’s trip to Tonga in gale/strong gale conditions with confused crossing and following seas followed by big following seas, Avatar’s trip south in like conditions on the nose, Osprey’s brush with storm force winds on the Tasman and structural integrity testing on a reef aboard Iron Lady, I think we can safely conclude that you have one hell of a design. No more testing is required – time for fair winds and following seas! What we need now is a real blow from aft, with big, well developed seas, to test surfing (with lots of sea room). Maybe on your trip back to the Islands? The effects of the “get home” prop assembly on surfing at an angle down and across waves will be interesting. Will the bow movement be meaningfully more abrupt with the extra stern gear? Given that many of the best surfboards have extra skegs on the back to better hold the waves, is it possible that the new rig will be a better surfer? The added skeg will benefit tracking in all probability, so in extreme running conditions it could be helpful. But better tracking brings with it less maneuverability, which is one of the tradeoffs with the get hom. The FPB 64 is so well behaved, and has such a large rudder, that we don’t think the latter is an issue.